For some time lets just forget all those quad core, dual core, etc. 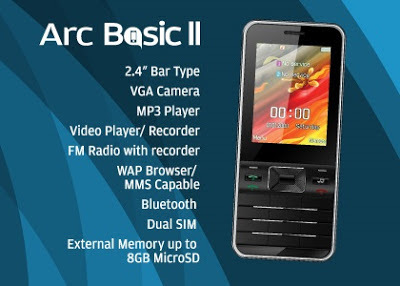 Lets consider those people who just wants a phone for text and call function with a little entertainment like music and taking pictures, here goes Arc Mobile Basic II. A simple yet built with its own OS, yep that's right, and it is call ARC Nuclues OS, alongside with that, this mobile phone is very cheap not even a thousand, for just only Php899 you can have this phone. One of the advantage of Arc Mobile Basic II is that it gives traditional way of texting, and we all know how fast it is to text using a keypad rather than pointing your fingers on touchscreens with less precision. In case you miss something here are the list of Arc Mobile retailers.